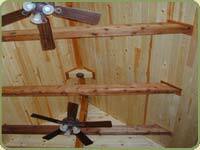 Like many of our readers, BCL Salesperson Bob Caughell spent this summer working on his home with material bought from Bear Creek Lumber. The results were so nice, he had to share. 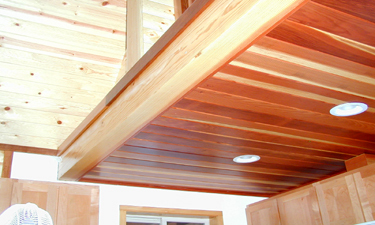 Pictured : the kitchen below has exposed Douglas fir beam 6 x 10 in the ceiling, with redwood tongue and groove beneath. The cabinets are made of cherry. 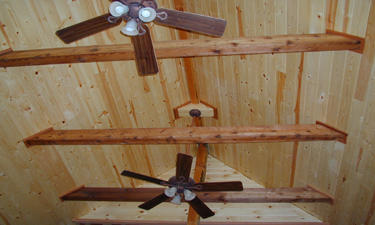 Right is a vaulted ceiling with #2 common pine T&G paneling with 4 x 8 Western red cedar beams and collar ties. 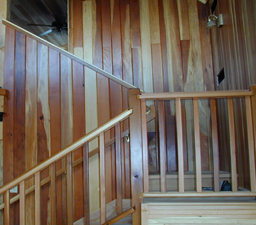 In the picture on the lower right Bob has his stairway built out of Douglas fir posts and beams with the landing built with fir tongue and groove. 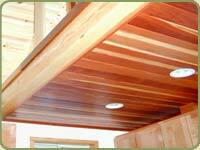 The rails, balusters and posts are western red cedar. 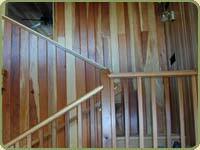 The wall paneling along the stairway and in the loft area is redwood 1 x 6 tongue and groove.